Uluru (also known as “Ayers Rock) is a UNESCO World Heritage Site.located in Kata Tjuta National Park, in the center of Australia. Uluru is a single massive rock formation that stands out from the flat landscape of Australia’s “Red Centre” desert. Both Uluru and Kata Tjuta are considered sacred places by the Aborigines. 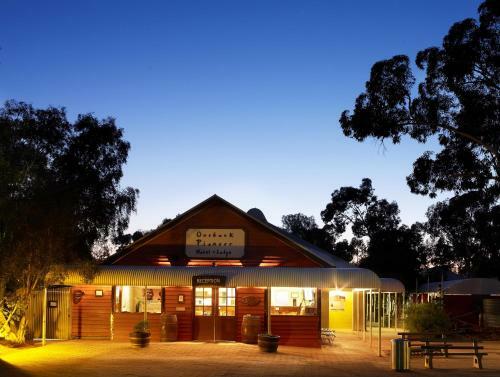 Outback Pioneer Hotel offers comfortable air-conditioned rooms, less than 15 km from Uluru (Ayers Rock). It includes a garden with a barbecue area and an outdoor swimming pool. Average score from 12 guest reviews: 0.0/10. Desert Gardens Hotel offers air-conditioned rooms, some with a private balcony or views of Ayers Rock (Uluru). Guests can unwind in the outdoor pool, or at the restaurant and bar. Average score from 14 guest reviews: 0.0/10. Outback Pioneer Lodge offers dormitory accommodation with access to an outdoor swimming pool and a shared kitchen. Free return transfers to and from Ayers Rock Airport (Uluru, Connellan Airport) are included. Average score from 8 guest reviews: 0.0/10. 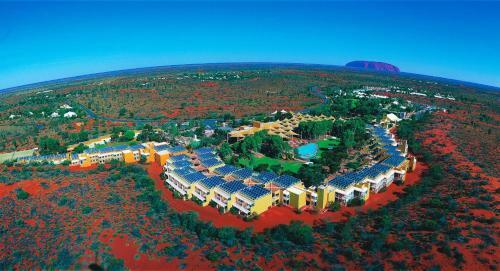 Emu Walk Apartments are just a short walk from Ayers Rock Resort centre. Each apartment is air-conditioned and has a TV with on-demand movies, plus a balcony or veranda. Average score from 9 guest reviews: 0.0/10. Perfectly positioned to make the most of the Australian outback, Sails in the Desert is just a 5-minute walk from the Uluru (Ayers Rock) lookout, also a great spot to take in the desert sunrise or sunset. Average score from 9 guest reviews: 0.0/10. See all hotels in Uluru (Ayers Rock). BOOK THIS HOTEL NOWSee all hotels in Uluru (Ayers Rock). Uluru is central and sacred to aborigine culture. Ancient rock are can be found in places, including the Mutitjulu Waterhole on the southern side of Uluru. The Cultural Center. Its worth a visit before walking around Uluru as it hosts a multitude of aboriginal creation stories and extensive articles about the history of the Pitjantjara. There are shops where you can buy local art and souvenirs. It's also a good place for a rest after trekking around Uluru. It was built in 1995 to mark the 10th anniversary of Handover (the process by which land was given back to the traditional owners, and Ayers Rock became Uluru). The rock is a so-called monolith, i.e. a single piece of rock or a giant boulder, extending about 5 km beneath the desert plain and measuring 3.6 by 2.4 km at the surface. It rises 348 meters above the plain and has a circumference of just under 10 km. The rock also extends some 1.5 miles underground. An interesting feature of Uluru is how it changes colors during the day, and over the course of the year. The sandstone of the rock contains reflective minerals that react differently to the varying positions of the sun, thus causing the surface to radiate different colors. Sunrise and sunset are especially good times for viewing, as the rock changes with its normal terracotta hue to blue or violet at sunset to flaming red in the mornings as the sunrises behind it. Uluru base walk. This is about 10 km long takes about 3-4 hours. Mala Walk (2 km). This track begins at the Mala Walk car-park and ends at the inspiring Kantju Gorge. Liru Walk is a walk between the cultural center and the base of Uluru. It is 4km and takes about 1 and a half hours. Kuniya Walk is an easy 1km walk to the Mutitjulu Waterhole on the Southern side of Uluru. There is some rock art here also in the rock shelter, and a good place to learn about the Tjukurpa (pronounced Chook-a-pa) of the area.